Hamsa Hand Bracelet - Made in Jerusalem, Israel. 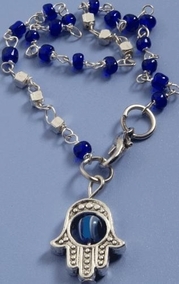 Silver covered bracelet and Hamsa pendant with tern around glass blue eye, that represent the Kabbalah Hamsa againts the "Evil Eye". The Hamsa Hand (or Hamesh) is an old and popular apotropaic amulet for magical protection from the evil eye. It is also a symbol used in amulets, charms, jewelry, door entrances, cars, and other places. The words Hamsa means "five" and refer to the digits on the hand. An alternative Jewish name for it is the Hand of Miriam, in reference to the sister of Moses and Aaron. The Hamsa Hand serves as an ancient talismanic way of averting and getting protection from the Evil Eye, or more generally of providing a "Protecting Hand" or "Hand of God". It appears, often in stylised form, as a Hamsa Hand with three fingers raised, and sometimes with two thumbs arranged symmetrically. Recently, some Israeli artists started combining the Hamsa Hand with their work. Some other made a new complete line of Hamsa hands, for decoration or for daily use. In the recent years, the interest in Hamsa symbols is growing, from several reasons the growing interest in Kabbalah and Kabbalah practice and Jewish symbols and the growing attention to mystical symbols, as the Hamsa Hand being one of them. We are proud to have such a meaningful gift in our judaica gift collection.